This is our second Mardi Gras blog. To see the first one CLICK HERE. Saturday, February 23rd at 6:00 pm: This parade takes place in Covington and involves the 300-member Krewe of Olympia that was founded in 1965. Members ride on floats, trucks and prancing horses. The rhythmic beat of marching bands adds to the excitement. The action starts in front of Tammany Parish Justice Center on Columbia Street and follows a route along Highway 21. Saturday, February 23rd at 6:30 pm: The male/female Mystic Krewe of Titans has 325 members and was started in 2010 by a group of Carnival veterans who wanted to bring Mardi Gras excitement to Slidell in a family-oriented nighttime parade. Head for Fritchie Park if you want to catch it right at the beginning. Sunday, February 24th at 1:00 pm: In Slidell the 250-plus members of the Krewe of Dionysus (also known as Bacchus, the god of wine) really strut their stuff -- as they have done since 1985. This parade starts on Spartan at Fritchie Park and travels to Pontchartrain Drive. Friday, March 1st at 6:30 pm: This is an all-female night parade in Slidell that’s bursting with excitement. The Krewe of Selene’s signature throws are handmade decorated purses. They also toss lighted star wands and very special strings of beads. This krewe supports “Ladies for Liberty” by sending items to American troops overseas. Friday, March 1st at 7:00 pm: This all-male Original Krewe of Orpheus parades through the streets of Mandeville on floats illuminated by LEDs (Light-Emitting Diodes), as it offers nine different throws that include beads, lighted wands and signature medallions. Their official “call and response” is HAIL ORPHEUS, HAIL YES. Saturday, March 2nd at 9:00 am: Come to a fun Krewe of Bush parade of trucks, boats, floats, horses and ATVs for a grand time. Must line up by 8:30 am. The parade travels from Bush Cowart to Watts Thomas Road and Highway 41. Tuesday, March 5th at 10:00 am: on Mardi Gras Day one can enjoy “Carnival in Covington” with many different activities and parades. 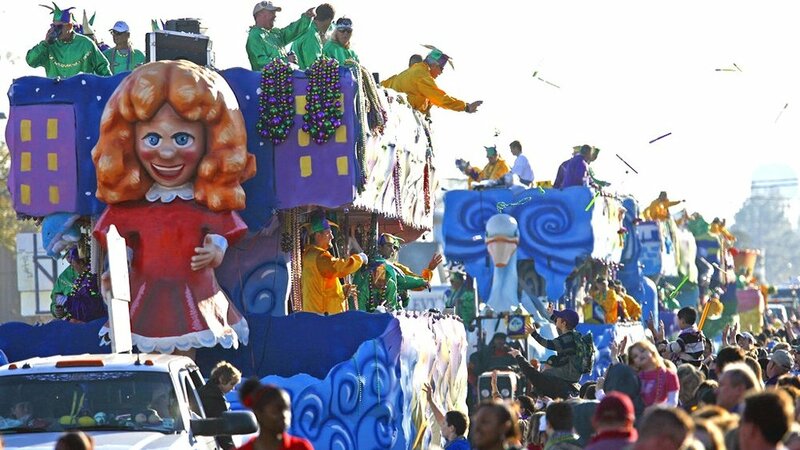 Starting in the morning, the parades roll one after the other. This includes walking groups, musicians, floats, antique cars, trucks, wagons and fun throws offered by the Krewe of Covington Lions Club and the Mystic Krewe of Covington. There is also an after-party that starts around noon. Tuesday, March 5th at 1:00 pm: The Krewe of Chahta was founded in 1989 and is named for the local high school – which many of the founding members attended. This Lacombe parade features floats, cars, marchers and horses. It starts at the Morocco Room and travels north on US #190. Tuesday, March 5th at 2:00 pm: This over-the-top day ends with an open invitation from the Krewe of Folsom for everyone to participate in its parade of floats, vintage cars, tractors, trucks, horse drawn wagons and RVs. The action starts and ends at Magnolia Park. And there you have it. No matter where you live in New Orleans and Louisiana you’re going to have a real blast on THIS VERY SPECIAL DAY. LET’S MAKE THE 2019 MARDI GRAS CELEBRATIONS MEMORABLE! CLICK HERE to get you and your loved ones in the mood for your NOLA visit. Don’t forget: Super Bowl Sunday is on February 3rd this year – at the Mercedes-Benz Stadium in Atlanta.